I work in Tanzania part of the year. I co-founded a nonprofit (Project Wezesha) and I work closely with a community there to increase access to education for children in remote regions of Western Tanzania. The only reason I can do the work I do, is because I have a partner there – a young man named Lucas Lameck. Lucas speaks English. He speaks it well enough for us to discuss big ideas, make strategic decisions, communicate over Skype and via email while I’m in the US. He completed a secondary level education and he admitted that it wasn’t until coming into contact with Americans through a job he held with another nonprofit that he actually learned to speak English. 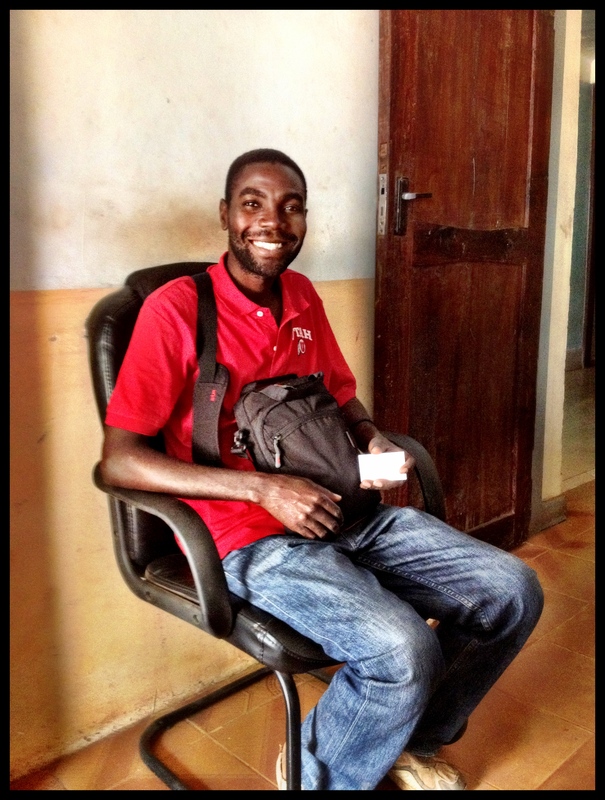 This photo depicts a leader from the town of Kigoma who came into the village where we work to mobilize the villagers. 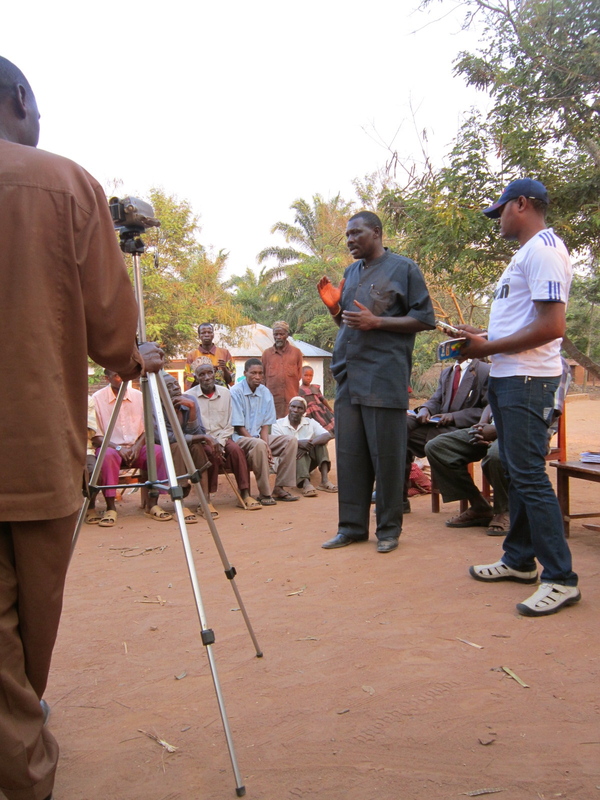 There was a point where the villagers weren’t contributing to the project as per our memorandum of understanding. In collaboration with our nonprofit, they committed a certain amount of labor and materials to the building of the first secondary school in the area. Given my limited Swahili and Lucas’ limited clout with the elders (given his age), our pleas and meetings were only so effective. Here, in this village gathering, this chairman from town used his oratory skills to captivate this audience and make sure that they knew the value of this school to their community. Of course, they knew – but they needed a little nudge to remember it wouldn’t build itself. Language is Power. Community is Capital. When you have community and strong lines of communication, anything is possible. In the world today, look at the power of the internet – it impacts change daily, both positive and negative. One film posted on YouTube, which made fun of the profit Mohammed, set off a series of attacks throughout the Middle East. In Saudi Arabia, Social Media sites are helping women get closer and closer to securing their right to drive. Through Facebook, Twitter and the Internet in general, thousands of dollars are being raised for the US presidential elections and for victims of Hurricane Sandy. Stars are born daily as Ellen discovers young talent and invites them to be on her show. Just look at Sofia Grace and Rosie! Anything is possible with the internet. We are exposed to the ideas of everyone out there. What we do with that information is the important part. Being a Global Citizen means thinking beyond ourselves and considering how we contribute to making the world a better place. TED.com introduces us to the ideas of people from all over the world within countless thematic units. In the EAL classroom, TED talks can inspire truly engaging lessons that promote social justice and civic engagement. This quote reminds us that teaching is not a one way transmission, but an interaction between individuals, ideas, content and language. When considering how to use videos in the EAL classroom, it’s critical to keep in mind that videos don’t replace teachers – they simply serve as a powerful tool that teachers can use within well-crafted lessons. Karenne Joy Sylvester keeps a blog entitled Kalinago English in which she posted 10 Speaking English Activities Using TEd.com. Here are some of those ideas, adapted to reflect ways to incorporate a focus on Global Citizenship and Civic Engagement. Making Predictions: Tell them the title and topic. Break students into pairs and ask them to brainstorm what the talk might be about. Ask them to write what they know about the topic – facts, opinions. Have them connect the ideas to local issues that reflection similar situations in their community (if applicable). Vocabulary Treasure Hunt: Give students some key words from the talk. Have them discuss what they think the words mean and how they might fit this talk. Ask them to listen for the words and how they are used. Write the sentences on the board and discuss the words in context. Can they apply those words to the local issues they addressed in the above activity? Identifying Main Ideas: After making predictions and building key vocabulary, have them watch/listen for main ideas. What is the message of the talk? Is it important? Why? What do they think about the speaker’s message? In pairs, have them summarize the talk in a way that would inspire friends or family. Taking a Stance (debate): Choose a video that is categorized as persuasive. Write the topic on the board (e.g., modern day slavery). Conduct a Think-Pair-Share: (Think) Have the students write their thoughts about this topic. (Pair) Then have them share some ideas in pairs. (Share) Finally, discuss as a class. Does this topic/issue/situation exist in their local community? In what form? Next, watch the video. Ask them to take notes while they watch – in preparation for a debate. Let them know they will have to take a side – so consider both sides of the argument/issue. After watching, divide them into groups – each with an opposing view. Stage a debate; then switch teams. Discuss the challenge in arguing against one’s true beliefs. Panel Discussion: In the class prior to showing the video, provide 2-3 students with the video transcript and some background information on the topic. Have them prepare to serve as ‘experts’ on a panel for the talk. In the next class, show the talk to the whole class. Then invite the ‘experts’ to the front of the class to perform as experts on a panel. Have the other students write 2 questions each about the talk; then invite them to ask the panelists. Journalism – Students can write newspaper style articles based on the talk to share the information with a local audience. Have them take notes as they watch the video, like a journalist at the actual talk. Role-play interviews (journalist and speaker). Narrative Essay / Journals – Have them reflect in writing about the talk (especially useful for talks that stirred them). Give them support if needed (i.e., length parameters, guiding questions, a hook sentence, a pre-determined audience for their writing). Critical Analysis – TED Talks are often based on an individual’s experience and passion. Invite your students to be critical about the issues. Have them consider the issue from multiple perspectives (i.e., if the talk presents a victim’s perspective, what might be the motive of the perpetrator?). Have them problemetize the ‘why’ behind the issue – why is this happening? why has no one stopped this yet? why is it important? why should we care? what is currently being done to address the issue? Argument Paper – TED Talks are great inspiration for developing writing around particular genres, such as argument or persuasive writing. Brainstorm audiences for their paper (e.g., policy makers, citizens, embassies, etc.). Have them write a compelling, well-organized argument to support their stance in relation to the issue. Synthesis of Articles – After the TED Talk lesson, have the students do additional research on the topic (i.e., online, in the newspaper, in magazines, etc.). Have them collect additional data on the issue and compile a mini-research paper on the topic. Does their research support or refute the speaker’s talk? Build videos into existing curriculum units (e.g., politics, environment, gender roles, science, technology, etc.). Target their interests – Ask them: What is important to you in the world? Then search for it. Always preview before you show to students; check for appropriate language and content; evaluate for rate and clarity of speech. Consider length – you don’t have to show the entire video; shorter is better so you can view multiple times in one lesson/week. Explore many English accents – English is a global language and comes in many ‘packages’ – none better or worse than another. Consider engagement level of talks; some are better than others. Develop activities to assess understanding and language use prior to, during and after the video. (*Formative Assessment. Seek to inspire – Compel your students to think of how they can enact positive change in the world. Choose Talks carefully & plan well! Provide the transcripts in case of video problems and to support students. Subtitle the videos if appropriate. Make sure your computer is charged! This entry was posted in EAL (ESL/EFL) Teacher Resources and tagged Civic Engagement, EFL, ESL, Global Citizenship, TED.com by Rai. Bookmark the permalink.